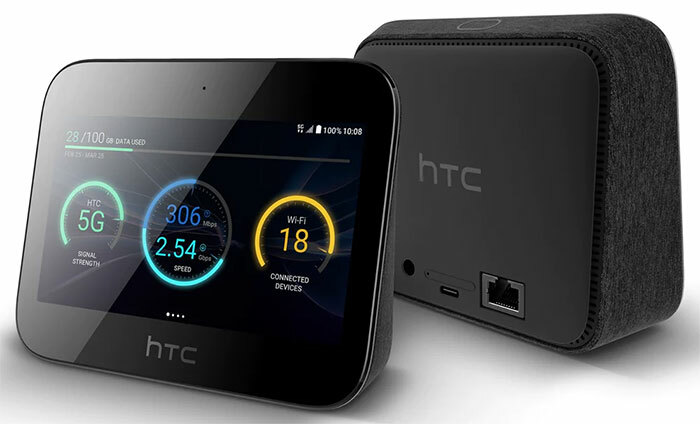 HTC has launched a new home-hub style smart device at MWC 2019. It looks a lot like devices such as the Google Home Hub or an Echo Show but it offers some interesting extensions to previoously seen smart-home assistant style functionality. Perhaps its primary purpose will be as a 5G hotspot in homes - but its 5-inch display, powerful SoC, Android 9 Pie, USB-C video out, and built-in battery open up many more possibilities. The new HTC 5G Hub is headlined as enabling smooth 4K video streaming, low-latency gaming, and faster networks in your home or office. Leveraging 5G speeds that are "dramatically faster than 4G LTE networks," the Hub can connect up to 20 devices to share its 5G connectivity. Snapdragon X50 5G Modem using Nano SIM support for up to 2.63 Gbps downlink. Uplink 287 Mbps. 4G LTE fallback support. 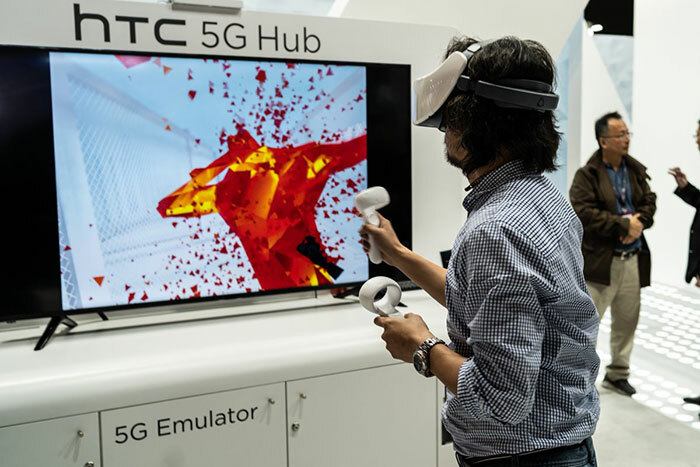 HTC has fingers in VR pies and it talks about its new 5G Hub being a great companion to the Vive Focus headset for "a mobile, high-end VR experience in real time" in the near future - no PC, no wires. More immediately, the hub enables "smooth 4K video streaming, low-latency gaming, and faster networks". It has voice and remote control for quickly accessing and playing media, or for streaming games at up to 4K and 60fps. The built-in 7,660mAh battery is claimed to last "all day" in the marketing material. And thanks to the battery backup you can easily take your router on a trip, to the park, or to a friend's house, for example. Reverse charging is available too. Office users might find the both the built-in Gigabit Ethernet and the easy configurable VPN functionality appealing. 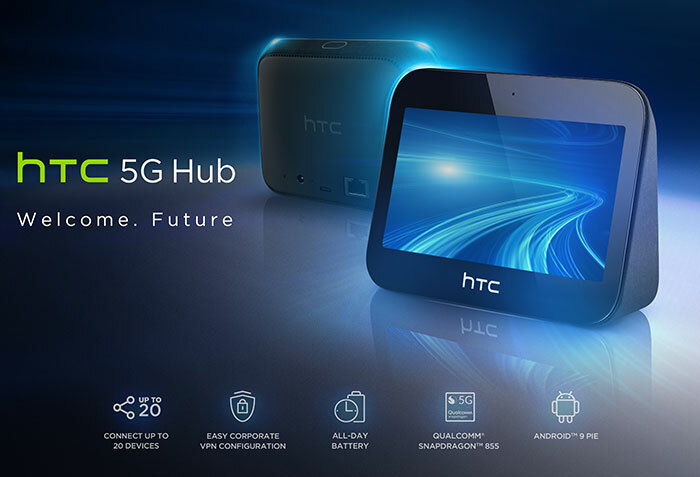 The HTC 5G Hub will be available from carriers such as Sprint (US), Telstra (Australia), Three UK, Deutsche Telekom (Germany), Sunrise (Switzerland), and Elisa (Finland). We don't have any pricing estimates - it might be mostly bundled in service contracts - but we hear the HTC 5G Hub will become available during H1 this year. 43 QOTW: Are you happy with your broadband provider? Just two letters for it: BS. they should have simply made a NV Shield competitor, this is wasted R&D money. (strange marketing of using it as a vive friendly add-on) …seems the only customers are those providers which means you will probably get one indirectly from the said providers. I am currently feeling like being in a non-competitive horizontal. Are you tired again? It does help when you've had a nap and a coffee then comment, makes more sense!